OOPI: Family Portrait ... our way. For the costumes, please select from the above widgets. Family Portrait ... our way. Now, it's probably not the best painting in the house but it has its place of pride on our staircase wall. The kids and I did this a couple of years ago. Unlike many families we know, we do not have professional family shots displayed proudly around the house. When the kids asked why, I knew it was time to do something, I didn't want them to feel we were missing out ... So I bought a large canvas and we got busy. The best part of this is that we can use it to send cards, make bookmarks etc ... with photoshop, the possibilities are endless. Loads of fun, no special skills required, so go ahead and make your own family portrait! OOPI is all about playing, imagining, marvelling ... It's about a piece a fabric becoming a cape, a ragdoll transforming into a princess ... 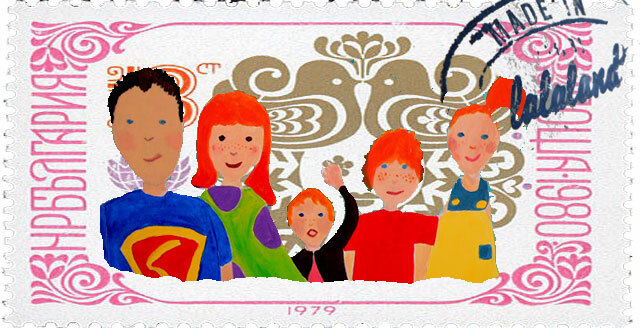 It's about celebrating all the bits and pieces that make childhood colourful, beautiful, inspiring .... It's about slowing down that crazy crazy pace that urges our children to grow up too fast. All the costumes at OOPI are handmade, home screen-printed and each model has been crafted individually. One of the main objective at OOPI is to create fun, yet durable, comfortable, costumes made with good quality fabric - not dreadful, itchy synthetic material(which sadly is often used for children dress- ups). Over the years we have collected ideas and inspiration from over the world and quickly realised that quality costumes/dress-ups for children often means extravagant price tags. We believed it's not fair! The other objective at OOPI is to keep a reasonable pricing. Behind each OOPI costume, there are several hours of work (and only two sets of hands) and because of the quality of the fabric we use, we can't sell you these costumes at a "Made in China" price, but we believed that long-lasting, fun and comfort should be affordable and our pricing is definitely set to meet these three points.